While default leak tests of 80 psi (5.5 bar) of no air/nitrogen bubbles visible or a high vacuum helium leak test are shown on most PAVE hermetic seal drawings, significantly higher pressure tests are usually available upon request for most designs to several hundred or more psi(bar) pressures. Certain designs can be tested as high as 10,000 psi (650 bar) or more! 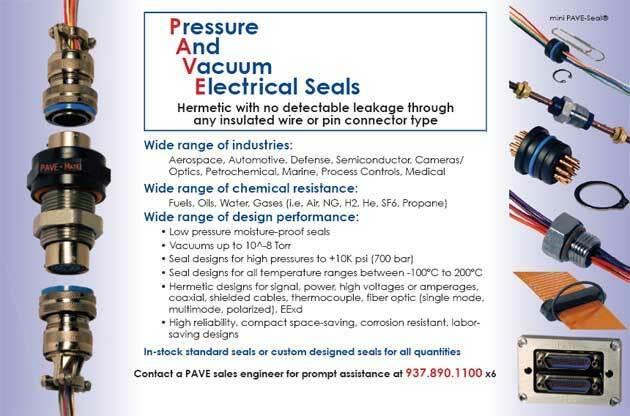 Regardless of the pressure differential amount whether low or high pressures, there will be NO detectable leakage of gases or fluids in any PAVE products, including those seals with stranded copper conductor wires and or shields that feed through the bulkhead using any type of wire insulation or wire lengths. PAVE hermetic seals are any type of insulated, stranded or solid plated copper conductors in any combination or lengths, copper or brass connector pin contacts or glass fiber optic cables of any type, all sealed for low or high pressures or vacuums, helium gas tight, moisture tight bulkhead seals available in unlimited wide range of combinations that can be easily customized for cost effective small or large quantities. Wire connector terminations can also be included for a complete, ready to use hermetically sealed thru-bulkhead wire connector harness.